1966, Gillo Pontecorvo, 125 minutes. Driven by powerful performances, The Battle of Algiers is a complex, award-winning landmark in film history that was initially banned by the French government for its exploration of the Algerian struggle to gain independence from French Colonialism. This enhanced three-DVD Criterion edition includes Return to Algiers (1992, 55 mins. ), a return to Algeria with the director and his son; a new behind-the-scenes documentary; a discussion on the film's influence with directors Spike Lee, Mira Nair, Julian Schnabel, Steven Soderbergh and Oliver Stone; The Dictatorship of the Truth (37 mins. 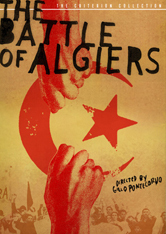 ), narrated by Edward Said, about the relationship between the director's politic and his filmmaking style; The Battle of Algiers and History with interviews with historians, former FLN members and more; a 30-minute excerpt from the documentary L'Ennemi Intime, focusing on the French-Algerian War; How to Lose the Battle But Lose the War of Ideas, a conversation on the film's contemporary relevance; theatrical and pre-release trailers; a poster gallery; and optional English subtitles.